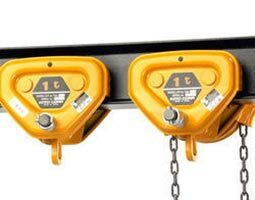 We are an established Supplier, Exporter and Importer, of Kito Geared Trolley Hoist that is extensively used for material handling operations in different industrial sectors. Our distribution network allows us to facilitate quick and convenient delivery in a matter of time at your doorstep. These are highly acclaimed by our important customers for long functional life and dependable performance. In the Trolley Hoist, the hoisting gearbox is directly mounted with rope drum and motor is mounted with gear coupling or geared brake drum which makes the working of the hoist all the more useful. We offer these at leading rates.